Asustek Computer has built an Android smartphone with 13-megapixel cameras front and back for the selfie lover. The phone seems nearly identical to the Zenfone 2, which launched a month ago in the U.S., but Asus upgraded the front-facing camera and touted the phone's photo editing software during a company event on Monday. The Zenfone Selfie not only comes with a more powerful camera, but also a dual-LED flash on the front and back of the phone. It has a 5.5-inch 1080p screen, but unlike the Zenfone 2 uses a Qualcomm Snapdragon 615 processor. In a brief test at the event, the phone did a good job of taking selfies, and the pictures appeared clear. Asus has added a quick way to access the front-facing camera: When the screen is off, a user only needs to write the letter "S" on the display, and the phone will move into selfie-mode. The feature seems to work, although it took about 3 seconds before the front-facing camera mode appeared. The phone's power button is on top, while the volume buttons are on the back cover, right under the camera lens, where LG puts them on its flagship phones. This may not appeal to everyone, and will take getting use to. 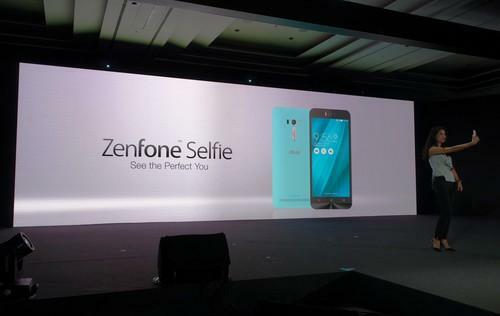 The Zenfone Selfie is a 4G phone that can have 2GB or 3GB of RAM and 16GB or 32GB of storage. It has a 3,000mAh battery. The phone will arrive in the third quarter. Asus declined to give pricing details.